You see… I just got married and my wife’s family is ALL. ABOUT. STORIES. We gather around the dinner table over Thanksgiving and Christmas and if someone does not explode up from their seat to emphasize the pinnacle of a story then I truly think something is wrong. Hands in the air, volume at 11, letting it alllll out. It’s an expressive bunch, and seriously, I laugh more than I have ever laughed in my life. You know what? At the end of it, we all feel closer together in our experience… In re-living those stories… And being a part of the events all over again. This is what your events serve to create. So, how do we encourage those lifelong stories? How do we as event professionals ensure that we are reminded of the good times of past? By showing photos! A picture is worth a 1000 words, right? All we gotta do is show that one photo and the stories start-a-comin! Now, why is this important?… Well, it’s a good story that is directly tied to your company is the best marketing, right? Isn’t that what marketing is? Telling stories? Yah… I’m like 93% sure I heard that somewhere. So, to launch this bad boy off, here are four of my best tips to keep the buzzzzzz (and stories!) going after your event! Post your photos on social media and tag your guests with a thank you note. 1) Post your photos on social media! Do you run a Facebook business page? Post your photos to a gallery and be sure to TAG the individuals in each photo! They will get a notification that you’ve shared photos and then scour the gallery for more. If they comment, share, or make that photo a profile pic, your event reach extends to their social networks as well. This works especially well for branded Step and Repeat style entrances or photo walls. #awesomesauce! 2) Print 4×6 photos of your guests and mail them in personalized cards. I support GLIDE here in San Francisco and every year after their Holiday Jam I get a hand written thank you card with several 4×6 prints (of me and my fiance!) included inside… Talk about an impressive level of service! Opening that card and absorbing this personal touch is totally awesome, and makes me feel like a valued member of their organization. One of those photos sits in my living room and I think of GLIDE every time I pass it! 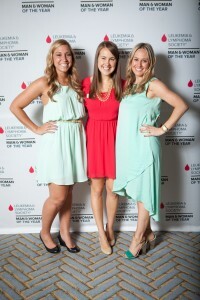 Step and Repeat Event Photos are great to include in your thank you letters! 3) Give people a shout out for their donations! Are you running a non-profit? Are you seeking donations or funding? Are you raising money for a personal Team-In-Training campaign? After your event, find a photo of someone who donated and post it to Facebook. In the caption say, “Jamie! Thank you for your donation to XYZ… We are so thankful for your support!” and then finish the post with, “If you’d like to make a donation of your own, visit our fund raising page here: URL Link”. Be sure to tag the person in the post, so that they get the notification. Your donor will feel awesome because of your shout out, and it gives you another opportunity to post your fund raising link without feeling like you’re nagging people. This also has the side of effect of putting social pressure on friends. No one wants to be that ONE friend who didn’t donate! This is a surefire way to keep your fund raising totals on the up and up after an event. Print your fun event photos and post them in your office. Smiles for DAYSS! 4) Print photos and post them in the office!